Wanna discover the highlights of Egypt in style? Topdeck's Essential Egypt trip is the one for you! Starting and ending in Cairo, this awesome short trip includes guided tours of the Pyramids and Sphinx at Giza, the Valley of the Kings, Luxor, the temples of Abu Simbel and more. Trust us – this trip is made of 100% bucket list material! Get pumped – you’re in Cairo! Go exploring and find out why the Egyptians call this place Umm al-Dunya, or ‘the mother of the world’. Just make sure you rock up in time for tonight’s welcome meeting, where you’ll come face to face with your new trip buddies. It’s gonna be an amazing nine days! First up today: meander the streets of Coptic Cairo and check out the Hanging Church, then head up to Cairo Citadel and get a load of those #views. Later, arm yourself with a pocketful of Egyptian Pounds and prepare to get your haggle on in Khan el-Khalili market. Expect gold, spices and every type of souvenir under the sun. Anyone for a fez or belly dancing costume? 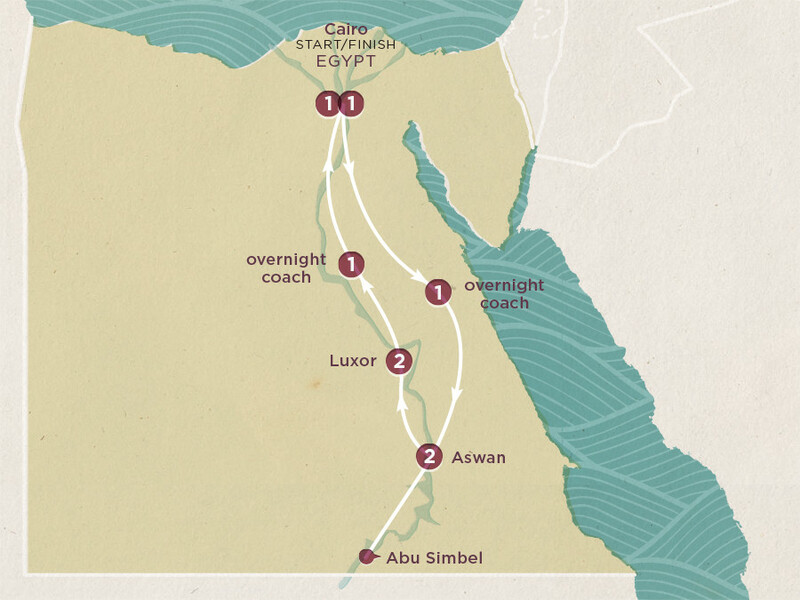 After you’ve shopped and bartered to your heart’s content, it’s all aboard the overnight coach to Aswan. Julius Caesar, Cleopatra, Lord Byron… they’ve all done it. Now it’s your turn! Go low tech with a ride on a felucca sailboat down the Nile and get comfy on the cushion-strewn deck. Try not to doze off, though – we’ve got a traditional Nubian village to get to! Here you can pick up handmade souvenirs, stroll past pretty multicoloured houses and get up close and personal with Aswan’s unique culture. If you fancy it, you can even opt in to take a camel ride (talk about life goals) or chow down on an authentic Nubian dinner. Top tip: try the ful. Roll out of bed, then prepare to feel like a small fry as you gaze up at the four colossal statues of Ramses II at Abu Simbel (you’ll want to make sure there’s space in your camera roll for this one). Want more? You could always pay an optional visit to the ancient Philae Temple, which is situated in the middle of Agilkia Island, and the impressive two-mile Nile High Dam. Round off a day to remember by drinking in the magic of the river at sunset. Nice one, Mother Nature. The trip ends here (well, breakfast first), but pop on that fedora and keep on exploring, Indy. New York may tout itself as the city that never sleeps, but it’s got nothin’ on Cairo! Today it’s time for a well-earned touch of Luxor – also known as ‘the world’s greatest open-air museum’. Once the capital of ancient Egypt, it’s now a history-laden landscape of souks and temples. Your challenge today is to see as much of it as possible. And… go! We’ll kick things off with tours of Karnak Temple (the largest religious building ever made) and Luxor Temple, one of the best preserved of all of Egypt’s ancient monuments. All together now: wowwww. Next up: the Valley of the Kings (aka the place everyone in ancient Egypt was ‘dying’ to get into). Expect tombs, and lots of them – plus a whole bunch of amazingly vibrant wall art that’s been waiting for you to come visit it for thousands of years. And did we mention that you’ll have a super knowledgeable Egyptologist as your guide? Listen up and learn the stories of the pharaohs as you pass from tomb to tomb. This is one experience with ‘bucket list’ written all over it! Wave bye-bye to Luxor – today it’s all aboard the overnight coach again as we head back to Cairo. Settle in and get comfy! There’s old, and then there’s the necropolis of Saqqara. Wander past towering pyramids and soak up some ancient history with a visit to this extensive burial ground before we move on to the Egyptian Museum to check out King Tutankhamun’s treasure chest. Then: get some perspective at the base of the 138 m Great Pyramid of Giza and the Sphinx. Trust us, even your goosebumps will get goosebumps! To toast your last night with your fellow Topdeckers, why not take an optional Nile dinner cruise? Fancy.